In a recent judgment, the Allahabad High Court held that land belonging to religious bodies can be acquired by the government for achieving a larger public purpose. The Allahabad High Court in Sankalp Institute of Education vs. State of UP, has held that minority self-financed institutions imparting professional or technical education cannot admit students of their choice by adopting a mechanism of their own. The Bombay High Court, in Priyanka Pravin Nikam vs. The State of Maharashtra, rejected the anticipatory bail application of a crèche owner after a video of her maid employee beating a 10-month-old child left under her care at the crèche brutally had gone viral. A division bench of the High Court held that the right of succession overrides the rights of a nominee. The bench of Justices AS Oka and AA Sayed have held that the rights of the successors prevail over that of the nominee of a holder of shares or securities appointed under Section 109A of Companies Act, 1953. The High Court passed a significant judgement regarding the disposal of claims for accidents under Motor Vehicles Act by the Motor Accident Tribunals in the state. The High Court ordered the Union Territories of Diu, Daman, Dadra and Nagar Haveli to pay a compensation of Rs.4 lakh for violating the fundamental rights of a journalist under Article 21 of the Constitution of India by illegally handcuffing him and parading him on the streets. The removal of a prisoner’s name from ‘Remission Register’ after registering a case against him for not reporting back in time after being released on parole does not amount to double jeopardy, the Bombay High Court ruled. A division bench of Justices AS Oka and AA Sayed of the Bombay High Court held the Maharashtra government in violation of its own water policy of 2003. The Court, in Chitra Sachin Mapara vs. Sachin Kumar Mapara held that any pressure on part of the wife on the husband to stay away from his parents without any justifiable cause amounts to cruelty. The Delhi High Court quashed notices issued by the Income Tax department to Bharti Airtel on account of failure to deduct tax at source on payments of interconnection usage charges to non-resident operators. The Gujarat High Courtheld that there is no provision for grant of temporary certificate by the Bar Council for practising as an advocate. 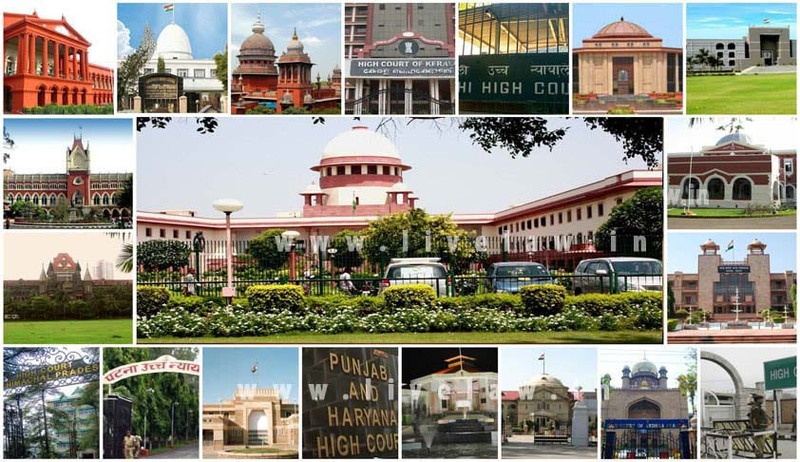 Taken over Elementary School Teachers Promotion Rules, 1993, the Jharkhand High Court held that promotions on the vacancies which have arisen shall be made strictly according to the seniority list. The court also directed the authorities to upload the provisional seniority list on the department’s website to enable online submission of objections by individual teachers. Put out by the ‘wilful violation’ of the court’s order to produce file on the government’s decision to withdraw the provision for accelerated promotion of Forest guards, the Jharkhand High Court pulled up the Secretary (Forest, Environment and Climate Change) of the Government of Jharkhand. He has been issued a show cause notice, asking why contempt proceedings should not be initiated against him for disregarding court directives. The Karnataka High Court dismissed a group of petitions by students challenging their rejection for admission to law course on account of their ineligibility caused by qualifying degrees obtained through open universities or 10+2 certificates directly without foundation courses. The High Court recently dismissed petitions regarding tracts of land in Vijayshreepura, Mysuru. Moreover, the bench declared people who had constructed houses there to be encroachers. A division bench of the High Court of Kerala ruled that under the guise of censorship, a film or artistic work cannot be banned without following a fair procedure. In a significant judgment, the High Court struck down Rule 14(2) of Kerala Minor Mineral Concession Rules 2015, which exempted the activity of extraction of ordinary earth in connection with construction of buildings on the strength of prior valid building permits issued by Local Self Government Institutions from the requirement of obtaining mining permit. The Madras High Court (Madurai Bench), in B. Senthil Kumar vs. The District and Sessions Judge, held that pensionary benefits due to government servants cannot be given to their brothers and step-brothers above the age of 18 years. The High Court recently directed the government to take necessary action to stop the activities of ‘shariat’ courts in the state. A division bench of Chief Justice SK Kaul and Justice M Sunder was hearing public interest litigation against the disposal of cases by the shariat court, without following the law and procedures. The High Court quashed the appointment of 11 members to the Tamil Nadu Public Service Commission (TNPSC) holding that the process of appointment was deeply flawed without following any transparent process and defeating the very constitutional scheme for such appointment. The High Court also held that District judges who were not allowed by the high court to continue the service beyond the age of 58 years would be ineligible to hold the constitutional post of a member of the State Public Service Commission. The High Court held that a widow is equally entitled, even after remarrying, to receive the Provident Fund amount from her late husband’s account. The Uttarakhand High Court ordered that no wild animals, including tigers, leopards and panthers, shall be declared man-eater/rouge and killed in the state. It also directed the Centre to formulate the National Forest Policy aiming on forest management, conservation and sustainable development also to maintain and increase forest covers and notify the same within six months as per preamble and guidelines framed by the United Nations Conference on Environment and Development, also called Rio de Janeiro Declaration/ Earth Summit/Forest Principles.